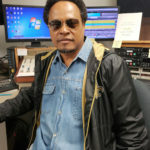 D’Anthony Monette is a veteran of the radio broadcasting industry; having worked extensively as a top-rated on-air personality, music director and program director in the New Orleans, Baton Rouge, Alexandria, Lafayette, Atlanta, Macon and the Lakeland-Winter Haven radio markets. Derek Monette, as D’Anthony Monette, has conducted hundreds on-air radio interviews with many of the major stars of the recording industry and has participated in nearly three-hundred live-remote broadcasts to date. In addition, D’Anthony has also performed as host of the “Weekly Entertainment Report” on Channel 13 WMAZ TV in Macon, GA. D’Anthony has filmed several television commercials, utilized in a number of national and regional media campaigns. D’Anthony, a native of New Orleans, LA and attended the University of Louisiana at Lafayette, with a major in Mass Communications. He enjoys cooking, traveling, growing plants, playing drums, collecting African art and clothing, reading at the library and spending time with his canine children.